It is almost certain that without the intervention of Steve Phillips and the help of his old communist networks across Alabama, Doug Jones would not be a US Senator today. President Trump would have one more vote in the Senate and the Republic would be at least slightly less imperiled. San Francisco lawyer, senior Democratic Party operative and stealth socialist Steve Phillips is using his wealth and influence to destroy the Republican Party’s southern base. First, his people helped turn Virginia from deep red to purple-leaning blue, then they “stole” a “safe” US Senate seat in Alabama. Conservative Republican Judge Roy Moore should have easily won his December 2017 special US Senate election against Democrat Doug Jones. It was a shoo-in. But when Moore was damaged by historic sexual impropriety allegations, Steve Phillips and his friends smelled blood in the water and they moved in for the kill. 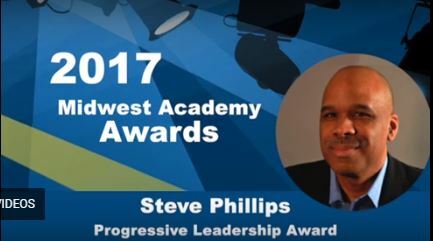 On December 13, 2017, the Chicago-based Midwest Academy gave Steve Phillips one of its two annual “Progressive Leadership” awards. This was one day after Democrat Doug Jones had defeated Roy Moore in the Alabama special election and Midwest knew where the real credit lay. Midwest Academy is so honored to give Steve Phillips, Founder of Democracy in Color an award TONIGHT as he was one of the architects of the victory in Alabama. Midwest Academy is one of the country’s premier “community organizer” factories. 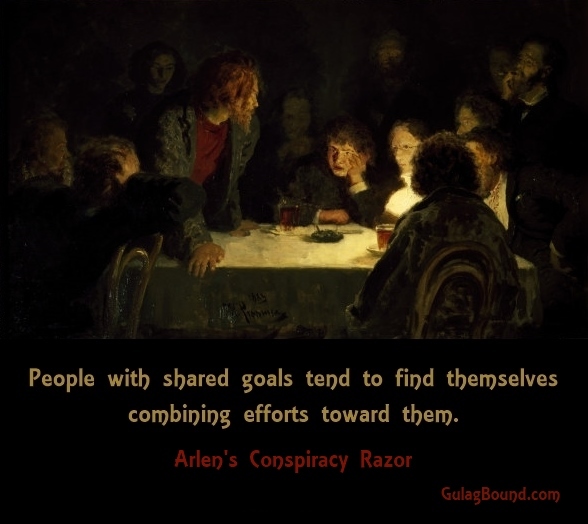 Dominated for years by Democratic Socialists of America members, Midwest has taught thousands of young radicals the theory and tactics of the legendary Saul Alinsky – then turned them loose on unsuspecting communities across America. Steve Phillips has several connections to the Midwest Academy Board. Eddy Morales – Director of the highly secretive Democracy Alliance’s Latino Engagement Fund, which is a “collaborative effort between individual and institutional donors designed to strengthen high-performing Latino civic engagement organizations and increase the political power of the growing Latino population.” Morales also serves on the Board of Steve Phillips’ PowerPAC+. Alicia Ybarra – Founding Director of Hispanic PAC USA. She has also worked with Unite For Dignity and Jobs with Justice in Miami, Florida organizing and training Latino and Haitian immigrants. Ybarra is currently working as the Training Director of SEIU International. Ybarra was also a student radical in MEChA and League of Revolutionary Struggle (LRS) circles at Stanford University with Steve Phillips in the mid-1980’s. 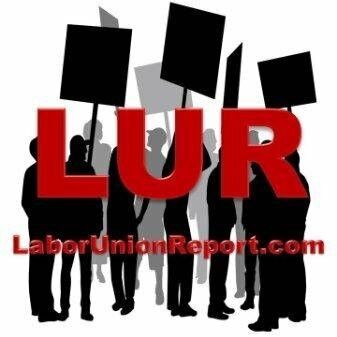 Like Phillips, she was also a founder member of the LRS’ successor organization Unity Organizing Committee. Marvin Randolph – A nationally recognized expert in voter registration, voter contact and Get Out The Vote operations. Randolph has worked on over 120 campaigns in 31 states. Randolph serves on the Board (director of community based electoral initiatives) of Steve Phillips’ Sandler Phillips Center. He is also President and CEO of Southern Elections Fund, serving under Board member Steve Phillips. Southern Elections Fund played a major role in Doug Jones’ Senate victory in Alabama. Southern Elections Fund (SEF) was originally established in 1969 by lifelong socialist Julian Bond to help elect local and state level candidates for office in the South. 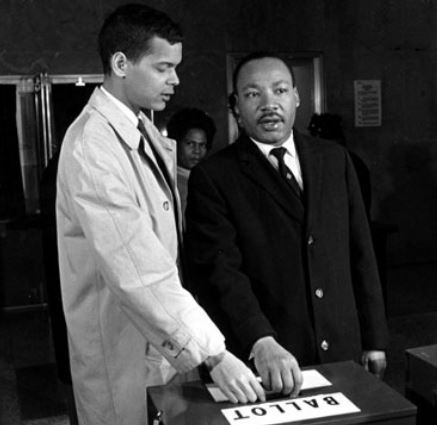 Julian Bond with Martin Luther King, Jr. In the early 1970’s, the SEF contributed campaign funds and technical advice to hundreds of candidates, many of whom were elected to office as part of a grassroots process that changed the nature and color of Southern politics. Former chairman of the NAACP, Ben Jealous, is a longtime colleague and financial beneficiary of Steve Phillips, so it was only natural that Phillips would join the SEF Board under Chairman Jealous. Andy Wong – Electioneering “mastermind, Steve Phillips’ former student radical comrade and Unity Organizing Committee founder. Board member of PowerPAC+ and President of Phillips’ related creation PowerPAC.org. Jotaka Eaddy – Former Senior Director for Voting Rights for the NAACP. Derrick Johnson – Founder and Executive Director of One Voice, Inc. and State President for the Mississippi State NAACP. 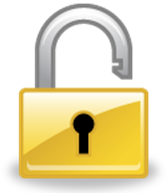 Closely associated with the Freedom Road Socialist Organization. The Southern Elections Fund raised funds for and helped direct a massive Get Out The Vote campaign in Alabama’s black communities. Doug Jones has a very narrow path to victory that relies primarily on an increase in the black vote. Jones will likely require 300K votes to win. This will likely require turnout of an additional 135k black voters. Mobilizing the black vote in Alabama will require efforts from the people with deep roots in the community. Marvin Randolph, President and CEO of Southern Election Fund, is the country’s leading expert on black vote mobilization. He has worked on 120 campaigns in 31 states and organized the largest black voter registration effort in history when the NAACP registered 400,000 black citizens in 2012. His connections to Alabama extend back over 20 years, and Southern Election Fund is well-positioned to work with Alabama’s community-based leaders to conduct an effective black voter mobilization program. DeJuana Thompson of Rubix Strategies is our Alabaman “boots on the ground” and long-term political professional who is running the operation from the local level. Some of the money came directly from Phillips’ organization PowerPAC. According to the Movement Voter Project (where Marvin Randolph serves on the Advisory Board alongside Steve Phillips’ wife Susan Sandler and Andy Wong), some money also came through Phillips’ entity Democracy in Color. How did we pick up a US Senate seat in an off-cycle special election in Alabama? Black Women and their teams on the ground knew what it took to win, and we are honored to have played a small role in supporting them! We worked our networks and identified two local black women leading the way – DeJuana Thompson and LaTosha Brown. With our friends in Solidaire, Women Donor’s network, Democracy in Color, and others, we collectively moved more than $500,000 – in less than a month! Most of the funds went through three major local grassroots operations (WOKE VOTE, RIGHTEOUS VOTE, and #BlackVotersMatter) which in turn supported 30+ local groups, 600+ organizers in 17 Alabama counties, as well as a statewide phone bank, peer-to-peer texting, rural black radio, and social media campaigns. We can win anywhere and everywhere when we support local organizing and don’t take communities for granted. But we need early and ongoing investments. You can click here to donate to continued efforts in Alabama. Let’s transform the South (and the whole country)! Ultimately, Thompson’s Woke Vote operation (and Righteous Vote, a similar effort created by Thompson to engage black voters through churches across the state), raised more than $2 million — most of it coming from out of state. DeJuana Thompson was no political novice. In 2008, she organized Barack Obama’s Get Out The Vote efforts in Florida, Georgia and Kentucky. Over the next eight years, Thompson worked primarily on Capitol Hill, initially with then-Alabama U.S. Congressman Artur Davis. Thompson joined Obama’s 2012 re-election campaign as African-American Vote Director for the state of Florida and did the same for Hillary Clinton in 2016. 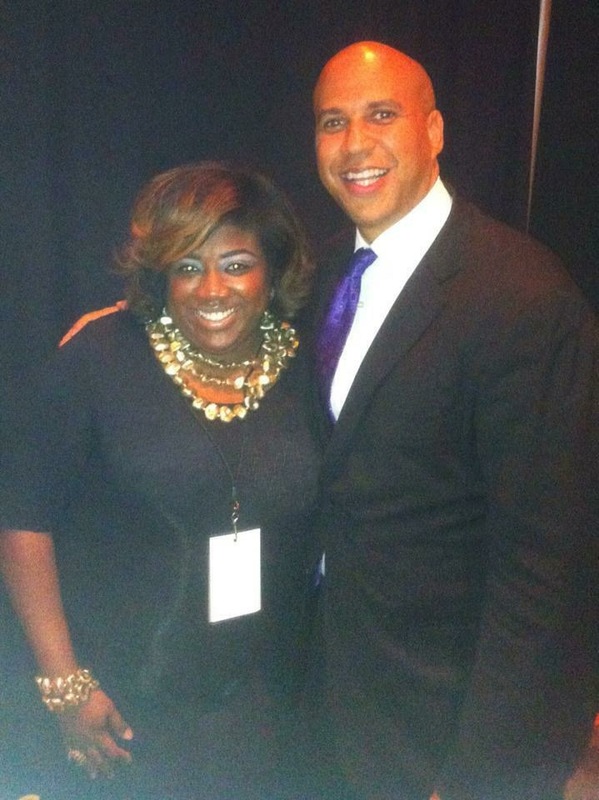 In 2013, DeJuana Thompson had also served as Deputy Field Director of Cory Booker’s successful US Senate campaign. 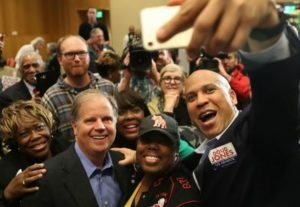 A longtime Steve Phillips’ protege, Cory Booker was soon enlisted to tour Alabama stumping for Doug Jones. Thompson’s team worked with organizations like black Voters Matter, Faith in Action AL and TOPS Society, to target the black and the youth vote. They succeeded. 97% of black women and 93% of black men voted for Doug Jones. 60% of voters under 44 years of age voted for Jones, while 60% of voters over 60 chose Roy Moore. Much of the black vote came from two areas – the Southern “Black Belt” and the Birmingham metro area. In the Black Belt, the influential Alabama New South Coalition (ANSC) played a major role in delivering the black vote, through their infamous “Vote or Die” campaign. Jesse Jackson was keynote speaker at the organization’s founding conference. ANSC is essentially run by two couples – Hank and Rose Sanders (known since she renounced her “slave name” in 2003 as Faya Toure} and John and Carol Zippert. Both couples have been mainstays of the Alabama left since the “Civil Rights” era. In the early 1960s, John Zippert joined the Congress On Racial Equality chapter at City College of New York. He was active in student government and Students for a Democratic Society and the Communist Party youth group W.E.B. Dubois Clubs. 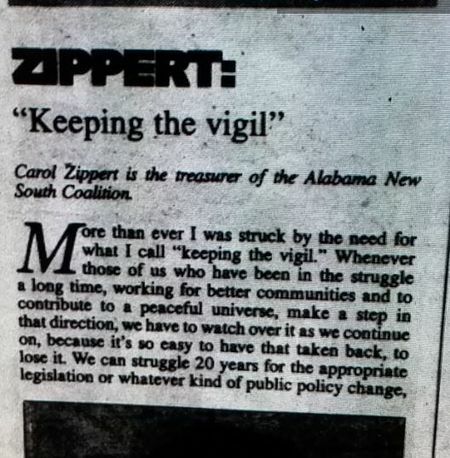 Zippert moved South to join the “Civil Rights” movement, where he met his Louisiana born wife Carol. Together they eventually settled in Eutaw, a tiny town in the Western sector of Alabama’s “Black Belt.” They were involved in several subversive groups including the communist-controlled Southern Organizing Committee for Racial and Economic Justice and the Federation of Southern Cooperatives. During the 1980s, the Zipperts became close with the Maoist organization Line of March (LOM). Both John and Carol published articles in the LOM Journal, Frontline. The Zipperts also publish a newspaper, the Greene County Democrat, out of the county seat, Eutaw. Eutaw, features a casino, Greenetrack, whose CEO is Luther Winn, a politically active businessman who supports the local NAACP and the National Action Network, the organization run by the Rev. Al Sharpton. Thanks in part to the efforts of Winn, the Zipperts and NAACP activists, (Doug) Jones carried Greene with an overwhelming 87 percent of the vote, a larger margin than Moore won in any county. In 2010, Sanders warned voters in a robocall that Alabama would go “back to the cotton fields of Jim Crow days” if Republicans rose to power. In 2013, he joined Nation of Islam leader Louis Farrakhan in leading a mass protest across Alabama of conservative Supreme Court Justice Antonin Scalia. Hank Sander’s wife Rose (Faya Toure) runs the state’s largest black-owned law firm. She once moved in the same circles as Steve Phillips. 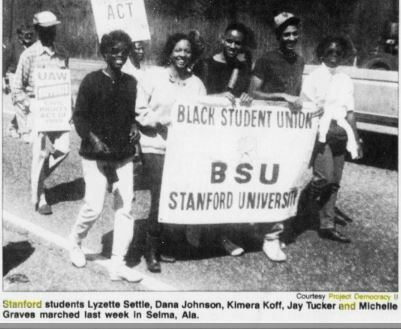 In 1990, Steve Phillips and a delegation of black student union members from Stanford University traveled to Selma Alabama. “to re-enact and commemorate a 1965 voting rights march and discuss the unfinished business of the civil rights movement. The Stanford group, calling itself “Project Democracy II,” went to record the history of the original march, called “Bloody Sunday” because it ended in bloodshed and violence, but in the process found a new chapter of history being written before its eyes. 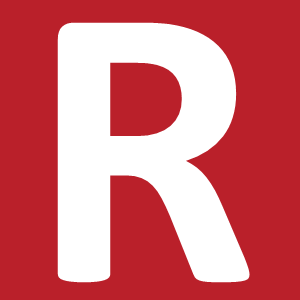 Leaders of the week-long event included the Rev. Jesse Jackson, Coretta Scott King, Rep. John Lewis and Rose Sanders. In 1988, in the July 18 issue, Rose Sanders, Campaign for a New South, Selma Alabama, endorsed Unity, the League of Revolutionary Struggle newspaper, which Steve Phillips occasionally wrote for. In 1992, Rose Sanders keynoted Unity’s 14th anniversary celebration in Steve Phillips’ home town of San Francisco. 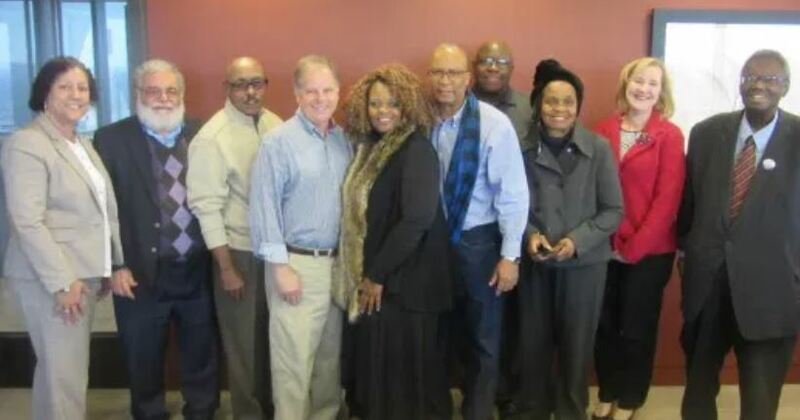 Senator Jones met with an Alabama New South Coalition delegation in January 2018 to “discuss priorities”. 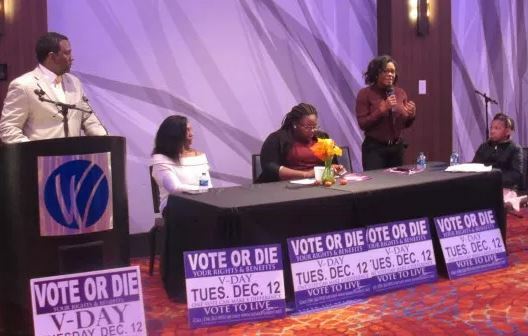 All of ANSC delegation members played an active role in the ‘Vote or Die Campaign’ to register, educate, mobilize and turnout voters in the December 12, 2017 Special Election, in which Jones defeated Judge Roy Moore. Senator Jones said that he would continue to communicate on a regular basis with the delegation about the upcoming state elections in 2018 and his own re-election campaign in 2020. In May of 2018, John Zippert ran for the State Democratic Executive Committee in District 72. I am running for the State Democratic Executive Committee because I want to help reform and revitalize the Democratic Party in Alabama. I want to build on the momentum we gained in electing Doug Jones to the United States Senate in the Special Election last December…The Democratic Party in Alabama must be part of a fifty state strategy to elect progressive candidates committed to assisting poor and working people make changes that increase fairness, justice and inclusion of all people and share the prosperity of this economy more equitably with everyone. The Birmingham Doug Jones Get Out The Vote effort was largely organized by a coalition lead by Scott Douglas, an old comrade of John Zippert from their Southern Organizing Committee for Racial and Economic Justice days. Scott Douglas was a member of the Communist Party USA until its 1991 split. Douglas then followed the spin-off Committees of Correspondence, but today is closer to Freedom Road Socialist Organization. 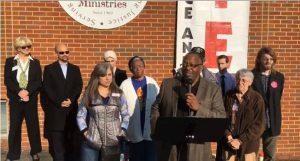 Two days after Doug Jones’ victory, Stand As One Coalition convened a press conference at Greater Birmingham Ministries. Scott Douglas at the mike. “We touched as many people as we could,” said Scott Douglas, speaking on behalf of the Stand As One Coalition. The green stripe of the Rainbow was also represented. “Alarmed by Roy Moore’s derogatory comments about Islam,” Alabama Muslims turned out in large numbers to vote for Democratic candidate Doug Jones. More than 20,000 Muslim voters – about the margin of victory for Jones – turned out and voted almost without exception for Jones, said Khaula Hadeed, executive director of the Council on American-Islamic Relations in Alabama. Democratic candidate Doug Jones defeated Republican candidate Roy Moore by a margin of 21,924 votes (1.7%).